Any FogBugz administrator can set up discussion groups, and there's no practical technical limit to the number of discussion groups that you can create. The real limit is social: how many discussion groups can you effectively manage? If there are too many discussion groups, it will be harder to get a critical mass of people in any one of them. My recommendation is to start with only one or two groups; you can always create more later if you find a good reason to do so. To set up a new discussion group, click the Discuss link on the main toolbar and then select the Customize option from the drop-down list. This will open the screen shown in Figure 5-16. Host online discussion groups for your team or for the general public. Using HTML, you can customize the appearance of discussion groups to match another web site. 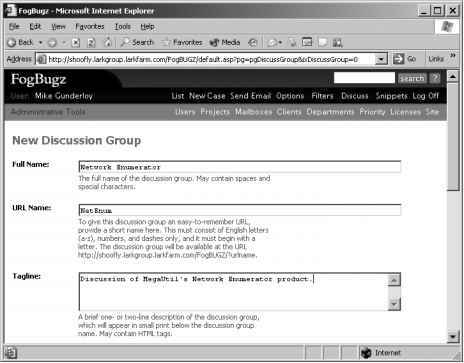 • To configure a discussion group, click the configure icon or the discussion group name. • To delete a discussion group, click the delete icon. • To create a new discussion group, click the new icon or the New Discussion Group link. • To customize the appearance of discussion groups, click the customize the appearance link (see the section "Customizing Discussion Group Appearance" later in this chapter for more details). Creating a new discussion group opens the screen shown in Figure 5-17. • Full Name is a complete name for the discussion group that will appear as a headline. You can use spaces and special characters in the full name. • URL Name is a short name for the discussion group that is incorporated into a simplified URL people can use to access the discussion group. For example, if your URL name is plans and your web server is running at http://fogbugz.megautil.com, this discussion group will be located at http://fogbugz.megautil.com/?plans (notice the question mark). • Tagline lets you supply a brief description of the discussion group (or any other small bit of text), which will appear below the discussion group name. The tagline may contain HTML tags. • Sidebar lets you supply text that will appear in the left-hand sidebar of the discussion group. The sidebar may contain HTML tags. This can be used to make links to other popular locations, to provide guidelines and FAQs, or for a decorative picture. • Posting Guidelines lets you supply text that will appear right below the message text entry field on new messages, telling people some basic rules for posting to the discussion group. The default text of "Don't use HTML. Surround URLs with spaces" is a good starting point. The posting guidelines may contain HTML tags. If your rules get too long, don't expect people to read them! • Days on Home Page is a number determining how many days' worth of topics will be listed on the main page. For busy discussion groups, use a low number like 7 to keep the main page manageable. For new discussion groups, 30 is a good start. Anything older than this number of days will disappear from the main page (although it will still be visible in the archive). While your discussion group builds up critical mass, you should adjust this number up to make the group look busier and avoid the dreaded "empty restaurant syndrome" in which nobody bothers posting to the group because it looks deserted. • Sort Posts determines whether to let AutoSort look at every incoming post, delete the spam, and hold suspicious posts for a moderator to approve. I recommend you leave this setting on. • Open to Public determines whether you need to be logged on to FogBugz to participate in the discussion group. Otherwise, anyone who can navigate to your FogBugz server can participate.